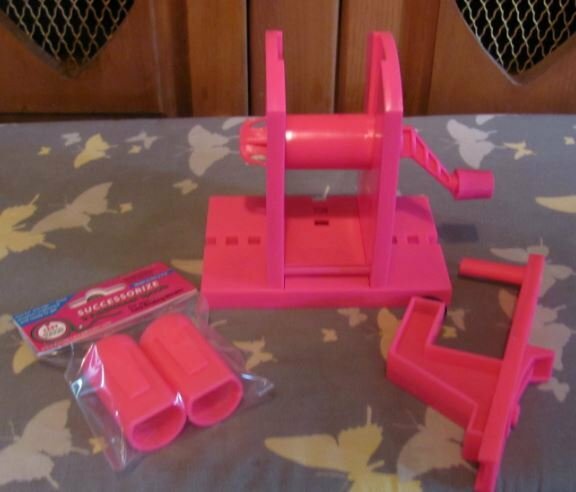 Here is the tool you never knew you needed but you'll wonder how you managed without it - the Easy Binding Winder! Designed for ease of use by anyone - even those of us with impaired hand strength or manual dexterity, arthritis and the like - the Easy Binding Winder is the modern alternative to the empty toilet paper roll. Wind your binding as you press it, then apply it directly to your quilt - the binding will feed easily off the unit when you set it beside your sewing machine, on the floor next to you ... whatever is comfortable for you. Are you organized and make your binding when you make your quilt top? No problem - our package includes two extra spools so you can make/press/wind your binding and then store it on the spool until you're ready to put in on your quilt. The Easy Binding Winder is manufactured right here in the U.S.A. and is lightweight, portable and easy to find - even in a cluttered sewing room (not that we know anything about that)! In stock now and ready for immediate delivery, you'll receive one Winder and two extra spools - three spools total.